In Chiropractic College we were required to learn everything there is to know about the nervous system. Literally, every single nerve, where the nerve originated and branched to, what functions it affected and even the names of the grooves and spaces the nerve would pass over or through along its length. I had the most ridiculous ways of remembering everything from acronymns, to poems or phrases. "My heart is in Vagus" was one I remember most clearly...from someone who has never even been to Vegas. But it stuck, and it worked. 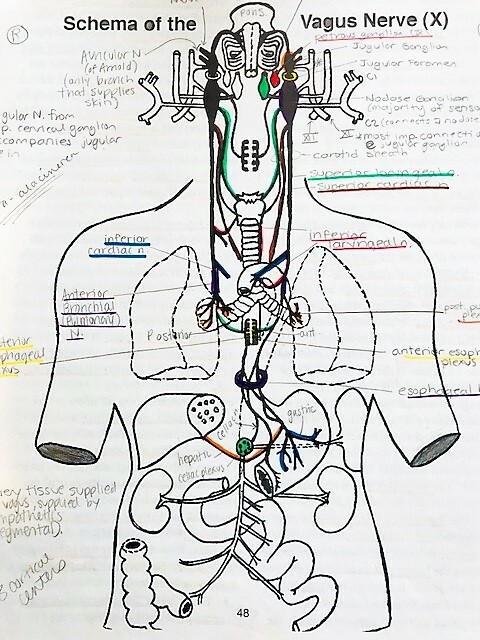 The vagus nerve does in fact have parasympathetic input to the heart, however it affects many more functions in the body also. In our stressed out, maxxed out culture, understanding this nerve and how to stimulate it is a powerful tool that will have a ripple affect on your health. It demonstrates clearly how interconnected our anatomy and physiology is, but also provides further evidence of the sometimes ignored mind-body connection. By now you likely have a hunch if 1 - your vagus nerve needs a little love and 2 - if your daily habits are supporting or inhibiting the nerve's influence. Here are 5 strategies that hopefully can become habits. 1. Wash your face with cold water. In fact, sudden exposure to cold can dial down our sympathetic system (fight/ flight/ freeze) and ramp up our parasympathetic system. Beyond washing your face with cold water, having a cold shower (or even ending your shower with a blast of cold) or using a cold pool (at least one gym in Calgary has one) on a regular basis can help! 2. Sing, chant or talk! No doubt the vagal connection to our voice box is a probable reason for this. Perhaps in your cold shower you can belt out a tune :). Although not for everyone, some yoga classes offer chanting (om chants have been shown to stimulate the vagus nerve) and singing also. This used to be super intimidating for me and not my jam, but the calming effect is undeniable. You literally feel your body vibrate. 3. Move - specifically mild exercise, yoga and meditation. My initial introduction to yoga was more out of homesickness at the time, and although I've experienced various physical benefits, its the grounding and calming that keeps bringing me back to my mat. Mild exercise and yoga also help stimulate gut movement which supports the vagus' role in digestion also. 4. Deep and slow breathing. Breathing with your diaphragm (seeing belly and side expansion with inhales) at a slow rate of 5-6 breaths per minute is key. Equal time breathing in and out stimulates the vagus nerve and improves sensitivity of baroreceptors - sensors in the heart and neck that regulate blood pressure. Increased sensitivity of these receptors allows the vagus nerve to be stimulated sooner when blood pressure rises. 5. Nutrition. Not only WHAT we consume (including EPA and DHA found in fish oil, and probiotics) but WHEN we consume it. There is a growing volume of information related to intermittent fasting that shows an impact on heart rate variability, a common marker for vagal tone. I could go on with more strategies, but I'm not sure who stuck it out to even get to this point in the blog :). No surprise, the action steps suggested above are pretty much universal lifestyle hacks to support much more than just the vagus nerve. Everything is connected and as I've said before, if we truly want to improve the health of our communities, we must understand how the healthy body works and support it.